Photo Credit: Dr. Susan Murphy. For as long as I can remember, I have loved microbes. I grew up with a microscope in the house—this was the coolest thing to me. I used to collect water from the neighborhood pond, take it home to look at under the microscope, and watch all the little rotifers and other creatures scurry around the slide. It was truly fascinating to me. Little did I know at that time, these tiny creatures could prove to have so much potential for improving the natural environment. Working in Dr. Claudia Gunsch’s lab for the Superfund Research Center’s Project 5, I had the opportunity to use tiny organisms, like the ones in my neighborhood pond, to grow bacterial biofilms that degrade polycyclic aromatic hydrocarbons (PAHs), a ubiquitous pollutant. Biofilms can be harmful in the medical setting because they may be pathogenic, can grow on IVs and catheters, and they often develop antibiotic resistance. However, from the perspective of an environmental engineer, bacterial biofilms can help degrade or eliminate contaminants found in the environment—this is known as bioremediation. The challenge in growing biofilms is not only selecting those that are best suited for the task of breaking down pollution, but also figuring out how they work with other bacteria and what they need to thrive. I worked to grow biofilms using six selected strains of bacteria that are known PAH degraders, in order to evaluate those best suited for our applications. Microtiter assays allow us to modify specific growth variables, such as the amount of pyruvate in the liquid growth media, to find the ideal conditions for the biofilms. Adding carbon growth amendments like cellulose, chitin, or wood flour into the growth media, which the microbes consume as food, can also help evaluate different bacteria strains. After growing and analyzing the six individual organisms, my mentor Savannah Volkoff, developed co-cultures using the PAH degrading strains in an attempt to determine which strains work best together to form a biofilm. After growing and selecting the biofilms, I analyzed them using a Scanning Electron Microscope (SEM). 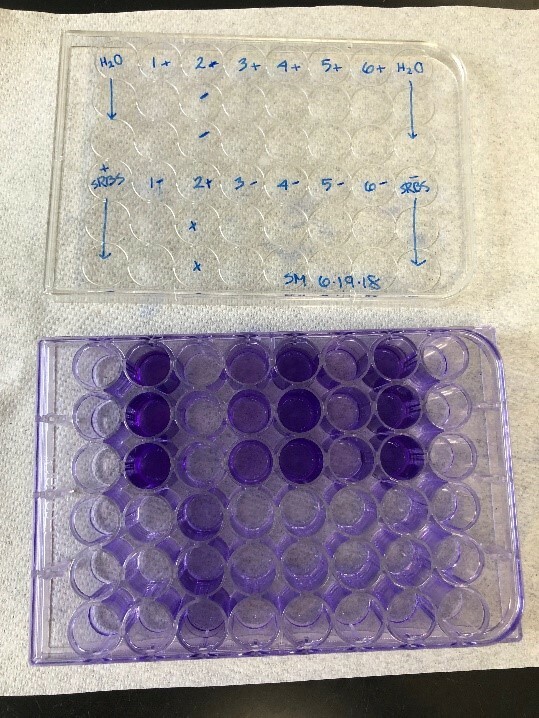 This technique allowed me to see and evaluate the biofilm development up close. Looking at the SEM images of the biofilms during their development made it easier for me to see how each strain looked as well as how the bacteria interact in the co-cultures. I hope to take the biofilm growth techniques I learned this summer back to the University of Tennessee at Knoxville to conduct research regarding bioremediation of heavy metals. Though it is slightly different than my research for the Superfund Center, after my experience at Duke, I can see the potential for using biofilms to eliminate and reduce toxins in aquatic (and other) environments. 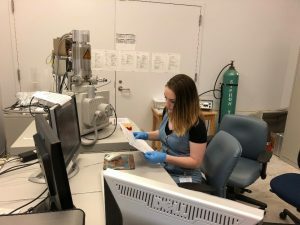 Thanks to the experience I have gained at the Duke Superfund Research Center, I have discovered a passion for microbial ecology and environmental engineering that grew out of my early interest in microbes and science. Thank you to everyone who has made this summer such an amazing learning experience.